Momo:tempo’s debut album is really the culmination of a lifetime’s creative adventuring. Like some old prophet, emerging from the shimmering horizon of the desert, in 2010 Momo appeared with this – a feverishly worked-in sketchbook journal of his travels. Except he was only sort of approaching middle age. And it was definitely more of a saunter. 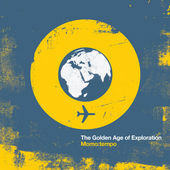 Featuring so many Momo classics, like Sweetseeker, Paris Breakfast, Disfunkshun and The Travel Writer, The Golden Age of Exploration is a lot of musical journey to cram into all the space an old-fashioned CD can handle.